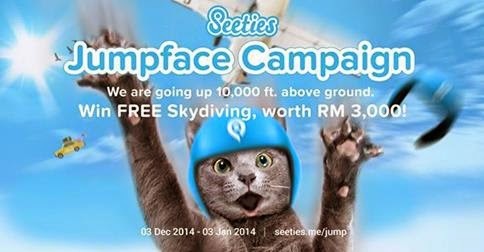 Home » Facebook » Free » photo » selfie » vote » Seeties Jumpface Campaign: Post your funny Jumpface and you may win a FREE skydiving worth RM3,000! Seeties Jumpface Campaign: Post your funny Jumpface and you may win a FREE skydiving worth RM3,000! Click on "Create My Jumpface" and connect with your Facebook account. Upload a selfie of your Jumpface, imagine yourself falling down from the plane. Be creative! Share your Jumpface on Facebook and invite your friends to vote - as many times as possible (people can vote for the same person once everyday, till the end of the campaign). 7 contestants who receive the most votes by 3 January 2015 win a FREE skydiving! Start your JUMP campaign today! Visit Seeties Jumpface campaign page for more details.